A beauty expert in the world of YouTube, Allison is highly recognized for her channel, “Amarixe.” In 2009, the wide array of beauty videos on YouTube sparked her interest and thus Amarixe was created (a combination of her first and middle name). Allison is in her senior year of college pursuing a degree in psychology and communication with a newly found interest in broadcast since starting her channel. 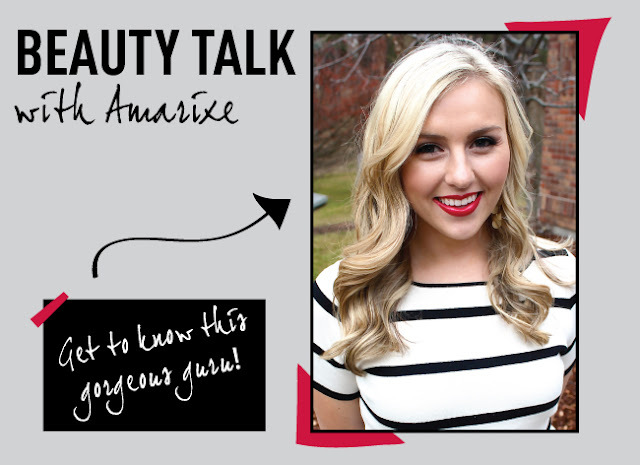 She has always been interested in makeup and "Amarixe" has allowed her to share that interest with other beauty fans. Read on to learn more! Sigma Beauty: What made you decide to start your own YouTube channel? Amarixe: I was home from college for the summer when I stumbled across the beauty community on YouTube. I’ve always been really into makeup, but had never found such a large group of people who shared my same interest. After a couple month of watching videos, I knew I wanted to get more involved in the community, so I created my own channel! It is definitely one of the best decisions I ever made. Amarixe: It’s hard to pinpoint one piece of advice as the best, but I think the tip I’ve used the most is to apply a light brown shade through the crease prior to darker crease colors in order to make blending easier. It’s a simple step, but it makes a world of difference! Sigma Beauty: Is there a beauty mistake you’ve made but have learned from? Amarixe: As a teenager, I didn’t take a lot of time to blend my eye shadow. I don’t think I even realized that is something you should pay attention to! I cringe at the thought of what my non-blended crease must have looked like... never again! Sigma Beauty: What are a few of your favorite Sigma Beauty products? Amarixe: Lately I’ve really been loving the Mrs. Bunny Essential Kit; the colors are adorable and the hairs are so soft! I also can’t live without my E40 blending brush - I use it every single day. Sigma Beauty: Where do you find your inspiration to create new looks and stay on trend? Amarixe: I’ve learned to look for inspiration everywhere! Aside from typical sources such as magazines and other media, I find myself also inspired by seasonal weather or beautiful photographs. The best thing about makeup is that it is art, and there is never a “wrong” way to go about expressing yourself! Sigma Beauty: What is your favorite makeup look to create? Amarixe: I love wearing neutral eye shadows with a really dark outer crease; I find that it makes my eyes look bigger and more defined! Winged liner and a bright lip is always fun, too. Sigma Beauty: What are three beauty items you can’t live without? Amarixe: MAC Paint Pots, Laura Mercier Silk Creme Foundation, and my Sigma Beauty E40 brush. I use all three of these daily! Sigma Beauty: Can you tell us a few fun facts people might not know about you? Amarixe: I lived in the Philippines for a few years when I was growing up. It was by far the best experience of my life to date. Being immersed in a culture so different from my own taught me some really valuable things. I’ve also played the piano since I was five years old, and my favorite TV show is Lost. Sigma Beauty: How do you choose which products to review and which trends to discuss? Amarixe: When choosing which products and trends to review, I ask myself if the content is something I would be interested in seeing in my own subscription box. If it isn’t, my audience probably won’t be interested either! Sigma Beauty: What can your followers look forward to seeing on “Amarixe” in the future? Amarixe: Hopefully a lot more of me! I graduate college this spring, after which I will have much more time to dedicate to my YouTube channels and blog. I think the best thing about YouTube and the beauty industry is you never know which trends or new products are around the corner, so everything is always fresh. I have no idea what people will be seeing on my channel a year from now, but I think that’s what is so exciting about it! She is one of my favorite YouTube gurus. I loved reading the post. The more i watch/read about Allison, the more i love her. She is so down to earth and really funny with a sense of humor just like mine. She's a little more daring in her make up then i am but i can always rely on her for an honest and in depth review on products, i just wish i had the money to buy all the stuff i like that she talks about... haha, don't we all! Thanks Sigma and Amerixe for the post, a good read. Thanks for reading! :-) We're glad you enjoy Amarixe as much as we do! Allison's beauty channel was the first one I ever watched. And I am so glad I did! I never would have known so many simple makeup tips and stuff had I not started watching her channel and many others! Hey I happened to visit your blog and I really liked it. Enjoyed reading all your wonderful posts :) Please visit my blog as well http://makeupmaja.blogspot.com/ If it interests, please feel free to follow me. I shall be happy to do the same for you. I like Allison very much. See seems like a nice person. Fun interview! I love her channel. She is one of my favorites! Loved learning new things about her. She reminds me of Scarlet Johansson in this picture! Yeah I have to say, of all the gurus, Amarixe really stands out because she is so genuine and kind... Other gurus (that shall go unmentioned) seem really aloof and almost stuffy to the point where I cant relate.